Is Your Dog Life in Need of a Makeover? Dog ownership is a life and bank account-changing experience. But it isn’t for everyone. Some owners are disappointed at how much a dog will (not can; “will”) ruin their garden. Others cringe at the on-going expense. Some are surprised when the puppy grows and triples in size within a year. Still others are astonished that, despite hundreds of dollars invested in training, clicker training, and late-night infomercial DVDs, the puppy still won’t come when called. Maybe you need a change? Maybe you need to change your dog? Changing and exchanging behaviors are well-established in our modern lives. Choose a younger one. Look overseas. Maybe choose someone who can’t speak English and tell you what to do. Don’t like your house or neighbors? Become an entrepreneur. Move to the competition. You can also change your life with your dog. And no, I don’t mean abandonment. God knows they’re far too many pet rescue organizations for every breed. Instead, you could change your dog. Perhaps a canine makeover Chinese-style? There is no lack of inventiveness in Chinese history. You’ve got the famous milestones like papermaking, the compass, gunpowder, and printing, as well as the creation of hundreds of other useful objects and processes such as the bristle toothbrush, rice and millet cultivation, steelmaking and procuring silk from silkworms. To this list, I add extreme dog makeovers as a much more recent breakthrough. How else do you characterize the recent news story of Chinese dog owners radically altering their pets’ appearances to represent other animals? 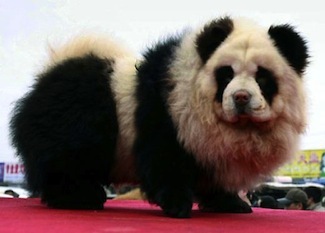 Apparently, some Chinese are trying to change their pets into exotic wildlife. If you’ve seen the Harry Potter movies, think of the Transfiguration class. Enough people have taken their pets to dog grooming parlors for a shampoo, trim and wacked-out dye job that Western media have written about it. Because it is not every day that you can publish a picture of a Labrador that resembles a tiger, or a chow that resembles a giant panda. Which, arguably, could be a good thing in a country where tens of millions still eat dogs. You’re far less likely to be mistaken for a dog and thus become someone’s next dinner entree if you happen to be a retriever that happens to resemble a tiger, or a chow in drag as one of the most famous and endangered species in the world. 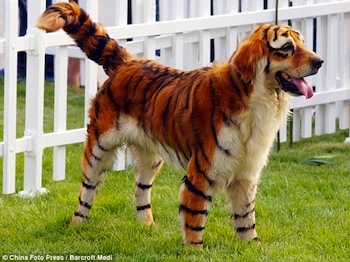 Is The Chinese Tiger Dog a Trend? Its difficult, though, to determine how many Chinese are doing this dyeing thing. In a country of 1.4 billion residents, give or take a billion, it takes a hell of a lot of people to become a trend. Even 5 million people doing the same thing would statistically qualify as “fringe.” Still, the Chinese have historically been quick to embrace wacky trends, not unlike the Japanese. Ready For Change in Your Own Life? Maybe you should change your status quo. Instead of divorcing your spouse and possibly sinking into the heated rhetoric and precedence of pet custody law, book an appointment for her at a local day spa. Take the boss that you can’t get along with to lunch. And that two-year old puppy that ruined the back lawn that you’d so carefully planted with Barenbrug Pebble Beach Golf Club-branded seed? Think really hard about giving her away to a shelter, or posting an ad on Craigslist. And think even harder about applying dye of any color to her fur. Love your puppy and she’ll love you back. Just please don’t show your love by doing what they’re apparently doing in Shanghai.